This developer house sits on a spectacular 5-acre wooded lot. The owners purchased the property primarily for the setting and over time have worked to bring the building more in line with their sensibilities. The house is perched at the edge of a creek, with views to the water and woodland from the rear windows and deck. The front of the house faces a lawn area that is separated from the road by a swath of woods. Upon entering the property, one sees the prominent 3-car garage and parking area–and catches a quick oblique glimpse of the front door. Our project began with a request to help incorporate a new mudroom by expanding the laundry room into the space of a small porch on the front of the house. Not only did the owners lament the loss of the porch, it was soon clear that there were other issues with the front of the house: drainage problems, infrastucture problems, and awkward plantings…not to mention the lack of connection to the front door. 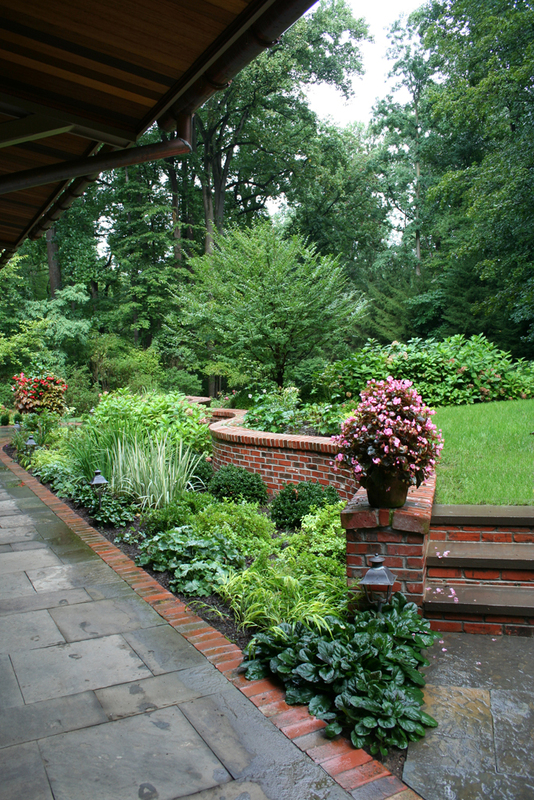 The solution was a new porch, walkway, and garden. To unify the building and landscape a series of subtle adjustments were required. The result is a telescoping space, from low-and-narrow to high-and-broad, as expressed by the staggered porch roof and the serpentine brick wall. The majority of the plants from the old garden were re-purposed in the new one: re-organized and supplemented.